From the Start Menu in the Windows taskbar, select Control Panel. The Control Panel opens. Open Windows 7 Control Panel. Open the Windows program listing. (Windows Vista/7) Click Programs and then Programs and Features. (Windows 2000/XP) Double-click Add or Remove Programs. From the list of currently installed programs, select TuneConvert. (Windows Vista/7) Click Uninstall at the top of the window. 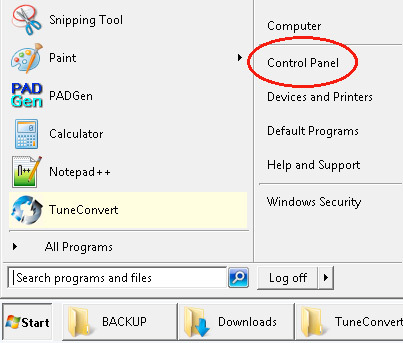 (Windows 2000/XP) Click Remove on the right of TuneConvert. In the TuneConvert Uninstall, click Yes. TuneConvert End User License agreement: eula.html.